Federal Threats Hindered California’s Progress in Further Advancing Health Care Reform Last Year — What Will 2019 Bring? The share of Californians who are uninsured has fallen by almost 60% in recent years. This astounding decline largely reflects California’s decision to fully implement federal health care reform, including strengthening Medi-Cal (our state’s Medicaid program) so that it reaches more residents who would otherwise lack access to affordable health coverage. Unfortunately, California’s progress in reducing the uninsured rate nearly ground to a halt in 2017 in the face of fierce headwinds blowing out of Washington, DC. Republican leaders in Congress tried to repeal the Affordable Care Act (ACA) and make deep cuts to federal funding for Medicaid, and President Trump used his executive authority to undermine the ACA in multiple ways. Will California be in a stronger position next year to push forward new policies aimed at further improving health care access and affordability? The answer will largely depend on whether the ACA and Medicaid remain intact. This, in turn, will hinge on the outcome of the November 6 midterm elections, which will decide whether Republicans retain control of both houses of Congress — and get another shot at rolling back federal health care reform. The share of Californians lacking health coverage in 2017 was 7.2%, down slightly from 7.3% in 2016, according to data released this month by the US Census Bureau. * On the bright side, California was one of only three states that saw a statistically significant drop in their uninsured rates last year. (Louisiana saw a 1.9% year-over-year decline; New York, a 0.4% reduction.) Uninsured rates were statistically unchanged in most other states. Still, the relatively small drop in California’s uninsured rate in 2017 paled in comparison to the major declines of the prior few years. 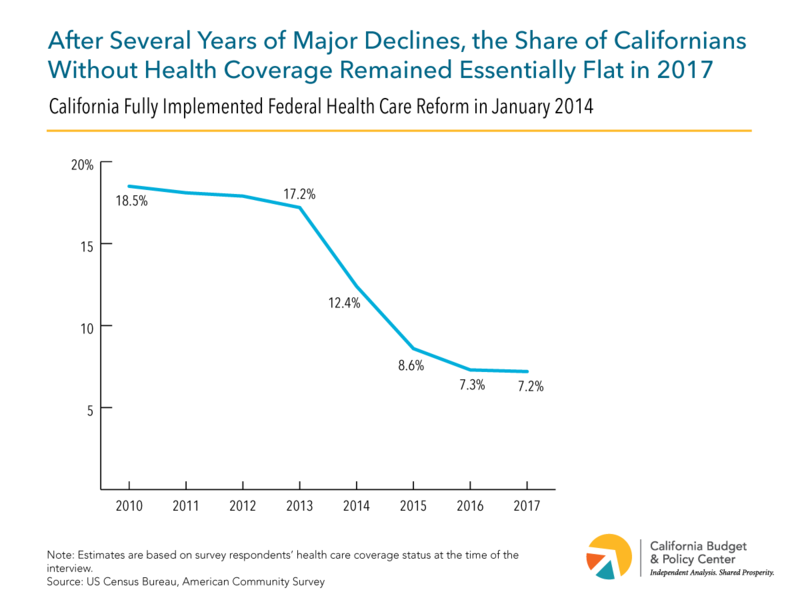 Between 2013 and 2016, the share of Californians without health coverage plunged by nearly 10 percentage points — from 17.2% to 7.3% — the largest drop in the nation during this period. In some ways, it’s not surprising that the decline in California’s uninsured rate has slowed. The large gains of recent years, particularly in 2014 and 2015, occurred as California rolled out new coverage options for low- and moderate-income Californians through Medi-Cal as well as through Covered California, the state-run online health insurance marketplace. With these new options, the number of uninsured Californians plunged by nearly half between 2013 and 2015, falling from 6.5 million to 3.3 million. This number declined further to 2.8 million in 2016, where it then stayed put (more or less) in 2017. Many Californians who remain uninsured face greater obstacles to enrolling in coverage than those who enrolled in the early years of health care reform. For example, a large share of uninsured Californians are undocumented immigrant adults who, under current policies, cannot sign up for comprehensive Medi-Cal coverage — even if their incomes are low enough to qualify — or buy private insurance through Covered California. Other Californians are eligible for federal financial assistance to help lower the cost of private health insurance, but find that this help is too small to make a difference. So yes, there were good reasons to expect California’s uninsured rate to begin declining more slowly as the ACA matured. However, the fact that our state’s progress in expanding access to health coverage nearly came to a standstill last year, rather than just slowing down a bit, suggests that something else was going on. Clearly, that “something else” was the turmoil in federal health policy that ensued after Donald Trump — who campaigned on a promise to repeal the Affordable Care Act — took office as President in January 2017. In 2017, Republican leaders in Congress made multiple attempts to repeal the ACA and slash federal funding for Medicaid. These efforts ultimately collapsed. However, the tremendous uncertainty surrounding federal health care policy forced state officials to focus their attention on protecting the ACA and Medicaid — as well as preserving California’s gains under health care reform — rather than on advancing policies to further expand access to health coverage and reduce the cost of health insurance. Unable to enact a full-scale repeal and deep funding cuts, Republicans found other ways to chip away at the foundation of health care reform. For example, the federal tax legislation passed last December ended the ACA’s financial penalty for being uninsured. This change, which takes effect in 2019, is expected to prompt many healthy consumers “to roll the dice and take the risk of going without health insurance,” according to a recent report from Covered California. In fact, premiums for health plans available through Covered California are already set to rise by an average of 3.5% in 2019 “due to concerns that the removal of the penalty will lead to a less healthy and costlier consumer pool,” state officials have noted. Moreover, President Trump has used his executive authority to undermine the ACA in multiple ways. These include cutting federal funding for marketing and outreach and shortening the open enrollment in federally run health insurance marketplaces; ending federal payments that reduce out-of-pocket health care costs for consumers with low incomes; promoting unnecessary and counterproductive work requirements in Medicaid; and expanding the availability of limited-benefit health plans (“junk insurance”), which offer skimpier coverage than ACA-compliant plans, lack key consumer protections, and can leave people with expensive uncovered medical bills. California policymakers have generally succeeded in shielding consumers from the impacts of the President’s executive actions. Moreover, Governor Brown recently signed key bills that push back against the President’s agenda, including Senate Bill 910 (Hernandez), which bans the sale of short-term health plans in California. California’s ability to invest in and further improve the state’s health care system over the next couple of years will largely depend on whether the ACA and Medicaid remain intact. The fate of federal health care reform, in turn, will hinge on the outcome of the November elections. If Republicans retain control of Congress, House and Senate leaders, with continued support from President Trump, will renew their efforts to repeal the ACA and gut federal funding for Medicaid. What’s more, a lawsuit aimed at undoing the entire ACA is winding its way through the federal courts and could ultimately be decided by a US Supreme Court majority that is hostile to the health care law. If Republicans ultimately succeed in their years-long quest to dismantle the ACA and gut federal funding for Medicaid, California’s health care system and state budget would be thrown into disarray. State leaders’ focus would inevitably shift from planning for the future to addressing the fallout from these damaging federal policy choices. In contrast, if the ACA and Medicaid survive in their current forms, state leaders could advance new policies aimed at continuing to move the state toward universal coverage and making health insurance more affordable, as the Care4All California coalition has been urging the state to do. For example, California could expand coverage options for undocumented immigrant adults by allowing them to enroll in Medi-Cal if they are income-eligible. There’s precedent for such a policy: California uses state funds to provide “full-scope” Medi-Cal coverage to low-income undocumented immigrant children and youth, a policy that took effect in 2016. In addition, California could boost the affordability of health insurance purchased in the individual market, which continues to be financially out of reach for many residents. One idea: Provide state-funded premium assistance to people who buy health insurance through Covered California. This new state subsidy would be on top of existing federal subsidies, which are available to households with incomes up to 400% of the poverty line — around $48,000 for a single person in 2018. Another option: Reduce the cost of copays and deductibles that people are required to pay when they visit the doctor or fill a prescription. This new state assistance could be targeted to households with moderate incomes — in the range of 200% to 400% of the poverty line — who purchase health plans through Covered California. Households with lower incomes qualify for relatively strong federal assistance to reduce the cost of their copays and deductibles. As with so many public policy issues, California’s approach to health policy couldn’t be further removed from that of Republicans at the national level. Moving toward universal — and universally affordable — health coverage remains a high priority for many Californians, including a number of state lawmakers and Gavin Newsom, the leading candidate for governor. In contrast, President Trump and his allies in Congress continue to look for ways to repeal the ACA and slash federal funding for Medicaid. Whatever the outcome of the November elections, health care policy will undoubtedly be back on the state and federal agendas — for good or ill — in 2019. * The changes in the uninsured rate reported in this post are statistically significant at the 90% confidence level. The data come from the American Community Survey (ACS) and reflect one-year estimates. These estimates are based on respondents’ coverage status at the time of the ACS interview and reflect “an annual average of current health insurance coverage status,” according to the US Census Bureau.